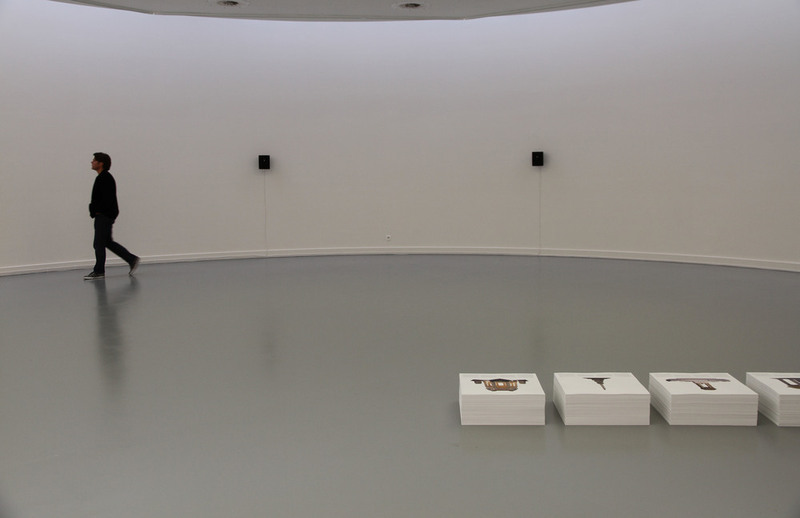 Recorded voices, looped, playing through nine wall-mounted speakers. Recorded at Run Stop Sound, Melbourne, August 29, 2013. I find nine monuments bearing the name ‘Palestine’ in and around Melbourne: Avoca, Caulfield, Coburg, Donald, Kew, Longwarry, Mooroopna, North Melbourne, and Terang. These monuments commemorate the presence of Australian soldiers in Palestine during WW1 and their role in the 1917 British capture of Bir Sab’a, or Beersheba (or Be’er Sheva, as it is known when it is captured and cleared by Israeli soldiers in 1948, its Palestinian population killed or gathered together and forcibly transported by truck to Gaza, Bir Sab’a becoming part of the new state of Israel). I walk right around the edge of that vast open space, surrounded by a fence without a gate. It is wedged between the historical Ottoman city of Bir Sab’a and the Israeli new city, a glassy office block, a mall, an eight-lane road with traffic whizzing along in both directions. This is where the Israeli soldiers enter Bir Sab’a in 1948. It is the site of the city’s Islamic cemetery. The low sun picks out the confusion of rocks and rubble and worn headstones scattered through the expanses of bare earth and long grass. The sites of the nine monuments bearing the word ‘Palestine’ are cleared. The nine monuments are gathered together. They are flown from Melbourne to Tel Aviv, and transported by truck to Bir Sab’a. They are installed as a single line, each monument abutting the next, side by side, to create a sixty metre-long monumental form that diagonally cuts across the busy road alongside the old cemetery, David Hacham Boulevard. This new monument blocks all eight lanes of traffic. All that stone, the bulk and weight of obelisks and rotunda and carved marble, become a kind of arrow, an over-scaled historical marker, pointing to that vast open space surrounded by a fence. It is a line for soldiers who would enter the city here. The nine inscriptions face the same way: Palestine. Palestine. Palestine. Palestine. Palestine. Palestine. Palestine. Palestine. Palestine. Comparative monument (Palestine), engages a peculiar Australian monumental tradition: war monuments that bear the name “Palestine”. These monuments, scattered all over Australia, commemorate the presence of Australian troops in Palestine during WW1 and, in particular, Australian involvement in the 1917 British capture of Bir Sab’a, or Beersheba (in turn a critical city in the events of 1948 and the Nakba). These monuments also reflect the realities of the 1920s (when they were erected) and the era of the British mandate, when the name Palestine implicitly invoked the shared position of Australia and Palestine within British imperialism. Comparative monument (Palestine) begins with a complete photographic record of these monuments bearing the name “Palestine” in and around Melbourne. Figuring this material into a Palestinian context through the form of a proposition for a new future monument – both a kind of ‘home-coming’ and exile for these Australian monumental forms – becomes a way to re-animate these linkages between Australia and Palestine. Nine speakers for a comparative monument (Palestine) is a sound installation and a companion piece to Tom Nicholson's Comparative monument (Palestine). Nine speakers are placed on the walls around the large exhibition space. Sounds of recorded voices emanate from the speakers, filling the room and creating an immersive aural experience that evokes the imaginary scene described in Comparative monument (Palestine) (see above). The vast open field of present-day Beersheba (Be'er Sheva or Bir Sab’a) is suggested with imitations of birdsong, whispering, whistling, and other vocal sounds. At regular intervals, sound monuments, granite-like chords of sustained tones, appear. Over the course of the 17-minute soundscape, a procession of nine sound monuments moves through the space, corresponding to the line of nine Australian war monuments as proposed in Comparative monument (Palestine). Voices sing “in memory of" and “in honour of”—phrases used in all the nine monuments and common to many war monuments. In the context of Beersheba, such phrases take on a wider resonance informed by the recent history of the region.